Michelle has been playing piano since age four, when she started Yamaha piano classes. Her musical studies experience was a "piano-cello-piano sandwich" as she began piano first, started university as a cello major for three years, then finished it as a piano major for three years. Her principal piano teachers were Garth Beckett in Waterloo and Tom Plaunt in Montreal. Michelle completed a master of music degree in piano performance at McGill University, as well as a licentiate diploma (LTCL) and fellowship diploma (FTCL) in piano performance from Trinity College of Music in England. The fellowship is considered equivalent to a doctorate without dissertation. 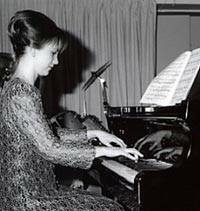 These are excerpts of past classical concerts performed by pianist Michelle Kyle (née Hunchak) while studying piano performance in university. All rights reserved. Enjoy!